If you made a New Year’s resolution on behalf of your small business, you are not alone. In fact, new survey data from Constant Contact reveals that 53 percent of small businesses make New Year’s resolutions every year, while 23 percent make resolutions every few years. When it comes to keeping these resolutions, however, the data shows that only one third of small businesses (33 percent) are successful, with 65 percent of respondents claiming they are “sometimes” successful. That said, 53 percent of respondents claim that keeping business-related resolutions is easier than keeping personal resolutions. When it comes to business-related New Year resolutions, revenue growth and efficiency tend to be the focus. 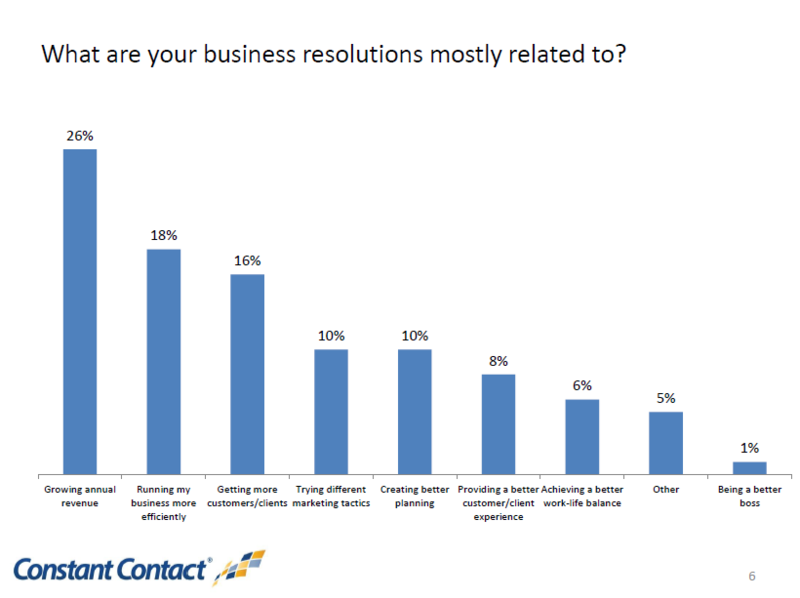 For instance, 26 percent of the respondents make resolutions to grow annual revenue, 18 percent make resolutions to run their business more efficiently and 16 percent make resolutions to increase customers. Moreover, 10 percent of respondents resolve to do a better job at planning, while another 10 percent resolve to try new marketing tactics and 8 percent make a commitment to create a better customer experience. •	"To expose my business to potential clients that don't know what services I offer"
•	"To increase social media presence on all levels by 15%"
•	"Be better at teaching my staff how to provide exceptional customer service, while offering irresistible bargains"
Did you make a resolution for your small business in 2014? If so, share it in the Comments section below.